First storm threat of the season, originally uploaded by captainjay. Well, preparations are being made for our first possible storm threat. Jay is hauling our boat out this afternoon and on Monday CYOA will be making a decision about securing their boats. I went to cost u less yesterday to stock up on a few items and today I'll be getting gas for the generator and gas grill. The condo we're in has accordion shutters on all the windows and doors so we're going to check them this morning to make sure they close. UVI preparedness committee will be meeting on Monday to put our plan in place. 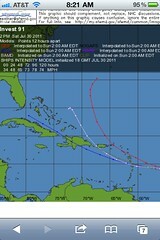 One of the storm tracks has it coming right over us but other tracks has it going south. It's supposed to be upgraded to a named storm later this morning, Emily. Keep your fingers crossed that it goes south. Interesting I really have no idea how I found your blog but some how I clicked on it from a google query. Now I am saying it to my favorites to watch. I have applied for a job and awaiting to hear if I am the one they chose. And, as far as selling it all we are actually doing that this weekend. House sold, things w/house estate sale .... not sure just yet where we are going but right at the moment hoping St. Thomas. Both of us will have to have jobs and we are mid- level professionals. Thanks for your blog and be safe.